When I develop web applications in Visual Studio, I often need to resolve issues that are dependent on the state of the cache or cookies. By default, debugging in a browser from Visual Studio opens a new browser window but does not purge any preexisting cache or cookies. 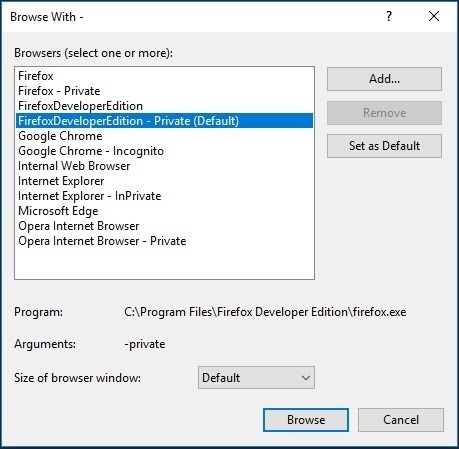 I like to configure Visual Studio to launch browser debug sessions in incognito/private browsing mode. Every debugging session is then fresh as if a user was visiting my application for the first time. 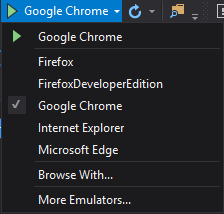 Click the Debug Target control’s right-side chevron to view the list of installed browsers. Configure the new target browser using the private/incognito command line argument. See the examples below. Not yet supported. Monitor this thread for updates.